. . . I learned about the importance of point of view, not from my graduate classes, but from our little daughter in a stroller. As I grow older I find my mind circling back on a few vivid memories from the past. One of my favorites is of a time when our family went to the zoo in Seattle for a Sunday visit. Our daughter, Margaret, was a little girl, still riding in a stroller. We went to see the apes and the lions, the monkeys and the polar bears. from an interview with Professor Lane published here. Ralón, L. (2016). “Interview with Bob Lane,” Figure/Ground. April 1st. A great grandmother of mine, who was a friend of Gibbon, lived to the age of ninety-two, and to her last day remained a terror to all her descendants. My maternal grandmother, after having nine children who survived, one who died in infancy, and many miscarriages, as soon as she became a widow, devoted herself to woman’s higher education. She was one of the founders of Girton College, and worked hard at opening the medical profession to women. She used to relate how she met in Italy an elderly gentleman who was looking very sad. She inquired the cause of his melancholy and he said that he had just parted from his two grandchildren. “Good gracious”, she exclaimed, “I have seventy-two grandchildren, and if I were sad each time I parted from one of them, I should have a dismal existence!” “Madre naturale,” he replied. But speaking as one of the seventy-two, I prefer her recipe. After the age of eighty she found she had some difficulty in getting to sleep, so she habitually spent the hours from midnight to 3 a.m. in reading popular science. I do not believe that she ever had time to notice that she was growing old. This, I think, is proper recipe for remaining young. If you have wide and keen interests and activities in which you can still be effective, you will have no reason to think about the merely statistical fact of the number of years you have already lived, still less of the probable brevity of you future. On reading . . .
She was puzzled. Later she went off to bed without saying much of anything. In the middle of the night I heard her weeping quietly in her crib. I went to pick her up and held her against my chest. She was in that state between sleeping and waking and was sobbing over and over again: “I don’t want to go down in that hole; I don’t want to go down in that hole.” That is symbolic language. What heart knew head guessed. The stories of the Bible are written in that kind of language. At the level where the human cry of mortality and mystery emerges is to be found the story line of the best of the stories from the Bible collection. 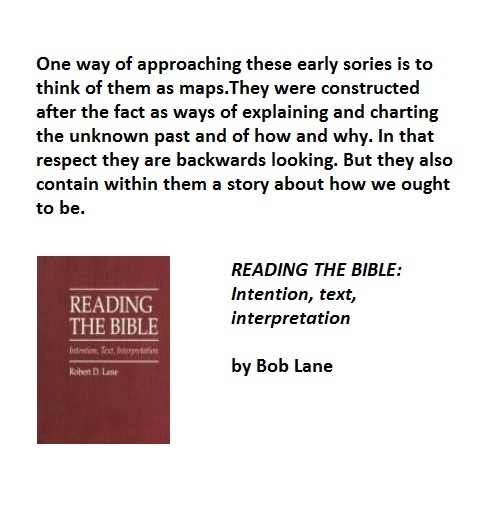 At another level, of course, is the official line, which offers an explanation, a reading of the stories, proclaims an interpretation, an ordering conceptual map.